Children enjoy an exhibit at the Brooklyn Children's Museum. The Brooklyn Children's Museum is a pioneer in its field and is the first recognized museum designed for and about children. Founded in 1899, the Brooklyn Children's Museum is dedicated to providing a stimulating learning experience to guests, while having the underlying message of respect for self, others, and for cultural diversity. The Brooklyn Children's Museum is filled with exhibits, collections, and events. In addition, weekends often feature special events, such as live concerts and other cultural happenings. The Brooklyn Museum has many visiting exhibits as well as a full load of daily activities. Permanent exhibits offer a variety of activities that inspire creativity and learning. The lush "Con Edison Greenhouse Garden" exhibit offers museum-goers a wonderful opportunity to learn about plantlife, ecosystems, and insects. Children are challenged to make their own observations of the life forms around them. They are then invited to draw their own conclusion based on what they have seen, heard, smelled, and touched. At "Music Mix," children are invited to get creative with music. This exhibit provides numerous instruments to explore, including xylophones, pan drums, and much more. Children can compose and arrange their own compositions and, in the process, develop a love and appreciation for music from around the world. The Brooklyn Children's Museum's "Animal Outpost" exhibit provides visitors with the opportunity to learn about animals, their behavior, and their care. Animals can be observed as they play, eat, and sleep. If the timing is right, children may also get to watch as a curator feeds Fantasia, their 17 ft. Burmese python. The library and resource room of the Brooklyn Children's Museum is filled with four thousand books, ranging from poetry and stories, science, and illustrations. There is also a wide assortment of reference material as well as public Internet access. The dynamic "Collections Central" exhibit features a whopping 27,000 cultural artifacts. Children can examine many of these objects using magnifying glasses, games, and puzzles to analyze all that they see. "Together in the City" contains a world within a world. In this special exhibit, there are pizzerias, Chinese New Year celebrations, a fort building, Yankee Stadium, and Bat Mitzvah festivities. The activities encourage cultural awareness and sensitivity and allow children to explore the world in a dynamic city setting. The "Totally Tots" exhibit was created for those under 5. All of the activities are designed to promote literacy, develop social skills, and exercise fine motor skills. Included in this array of activities for tots are a play pond, a reading nook, and the baby patch. "Tank Theatre" offers children a wonderful chance to play pretend. Children can dress up in a wide assortment of costumes and act out any number of plots. In addition, the children can examine the use of theater sets and lighting. 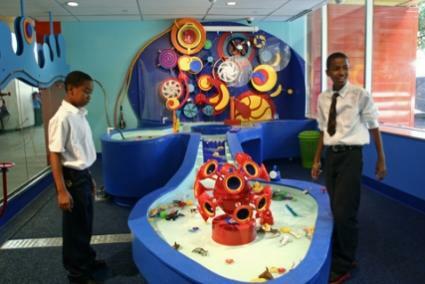 The Brooklyn Children's Museum is a dynamic place visited by 250,000 tourists and New Yorkers per year. The museum offers a wide selection of activities that change daily, seasonally, and yearly. When planning a trip it is a good idea to call ahead at (718) 604-7442 and see what events are happening. The Brooklyn Children's Museum is open Wednesday through Friday from 1:00 pm to 6:00 pm and on Saturday and Sunday from 11:00 am to 6:00 pm. It is located at 145 Brooklyn Avenue, Brooklyn, NY 11213.